When I started Comprendia little over a year ago, I actually had some doubt as to whether WordPress, a software popular for blogging, could be used to create my entire site. With the knowledge I had of web programming and WordPress, some through my personal usage, I quickly developed a branded, web 2.0 site. Now, it appears to me as if WordPress is taking over. If you look closely, you’ll see many websites are using it. Several nice examples of corporate WordPress sites exist here and here. 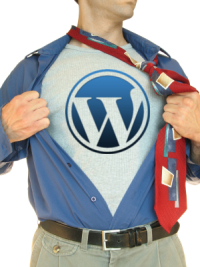 Why is WordPress so great? It has a highly customizable front end, with a user friendly back end as well. This translates into professional-looking websites which can be easily edited by non-professionals. This combination creates the potential to make businesses of all sizes more functional on-line and responsive to their customers, even if they choose not to use WordPress blogging feature. It is a stellar example of open source software, meaning that developers literally all over the world have written ‘plugins’ and ‘themes’ for it, making it infinitely customizable. Using it, I created the Comprendia site and the SDBN site quickly. Both are branded sites with many web 2.0 features, and I am able to quickly change content. Additionally, search engines LOVE blogs and WordPress can be configured to dramatically improve your ranking, which I’ve used to quickly reach the first page of results for terms that I think are important. What does the ‘WordPress Wrevolution’ mean for life science/biotech companies? For small companies, it means you can set up a professional looking website with an integrated blog, and it can be branded and doesn’t have to look like open source software. Interesting scientific news and articles can easily be fed into your site, adding functionality and content. Your site can easily be integrated with and leverage other social media, creating a comprehensive strategy gain exposure and new customers. Mid-size life science companies Accelrys and Promega use WordPress for their blogs, even Johnson & Johnson’s JNJBTW blog uses it! Hopefully, this embracing of WordPress means we’ll see more blogs and interactivity from biotech, life science, and pharma companies in the future. Currently, as we’ve covered, the number of blogs from our industry is very small. My niece Anne is doing a ‘virtual internship’ with me this summer, and some of this includes learning WordPress so she can update the Comprendia and SDBN sites. Typical of her generation, I asked her to do it, and although she knew little about it to begin with, she told me you ‘just have to figure it out’ and picked it up quickly. We can all learn a lot from her attitude, and realize this ‘just do it’ mentality is all we really need, regardless of whether we ‘grew up’ with Facebook. How do you get started? Check out the links below to get your feet wet. While we encourage you to try it yourself, we can also help you to create a branded and unique website and blog, or integrate a blog with your existing website. We work with a team of designers and developers, and together with you we’ll create a site that will help you to grow quickly. Contact us for more information, check out our Biotechnology Marketing 101 blog series, and sign up for updates via our RSS feed. This video explains the significance of blogging. Mashable is the leading source for social media lists & howto’s, and they have a separate section for WordPress, with useful lists of the best themes, plugins, and resources. This article provides some of the key features of WordPress that distinguish it from other blogs. This site gives two helpful videos on how to start a post and save a draft. This article gives instructions on how to start a page. This article explains the difference between a post and a page. This article explains the difference between WordPress.com and WordPress.org. This article provides helpful tips on how to get more views and traffic to your blog. This article provides a basic introduction to WordPress terminology. Mary – This is a very useful summary of your favorite things about WordPress blogging software. I’m curious to know if you have also tried other blogging softeware? I also wonder if the open source aspect was a big factor in your decision to go with WordPress or was it the very reasonable price (or all of the above)? Commercial software suppliers must wonder how to differentiate themselves. Are there things you don’t like about WordPress? I’m on the steep slope of a learnig curve and your thoughts would be helpful. Thanks for the post.